Epic RecordsBecause there haven’t been enough films based on toys from your childhood, get ready for Playmobil: The Movie. 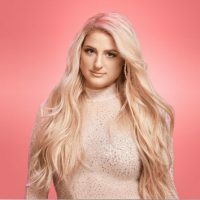 Deadline reports that Meghan Trainor and Adam Lambert are among the stars lending their voices to the movie based on the German toy line. It’ll mix animation and live action and feature original songs by Meghan and Adam. In Playmobil: The Movie, Meghan will play a fairy godmother, while Adam will voice the villain, Emperor Maximus. As for the plot, Gabriel Bateman plays Charlie, who gets lost in the animated Playmobil universe. His sister Marla, played by Anya Taylor-Joy, then has to go on a quest to find him and bring him home. Along the way, she gets help from a food truck driver played by Jim Gaffigan, a secret agent played by Daniel Radcliffe, and Meghan’s character. Playmobil: The Movie will arrive in 2019. Other toys that have inspired movies include the game Battleship, Lego, Uglydolls, Smurfs, Barbie, Trolls and Transformers.